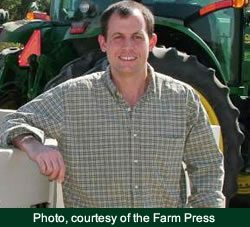 Bowles Farm was established in the 1850’s and over the years has transitioned from a predominately cattle operation into a multiple crop farming system. The crops and acreages change from year to year but a common mix would include cotton (3,000-5,000 acres), processing tomatoes (1,500-2,000 acres), alfalfa (2,500 acres) , corn and wheat (2,000 acres) with other crops such as melons, onions, and fresh market tomatoes added to the acreage as needed. The Dos Palos area receives approximately 10 inches of rainfall annually, primarily during the winter, and thus 100% of the farm is irrigated with furrow and drip irrigation. The soil type is a clay loam with considerable variability from field to field and within fields. Bowles Farm uses remote sensing technology to manage the growth of cotton under the variable soil conditions associated with the farm. 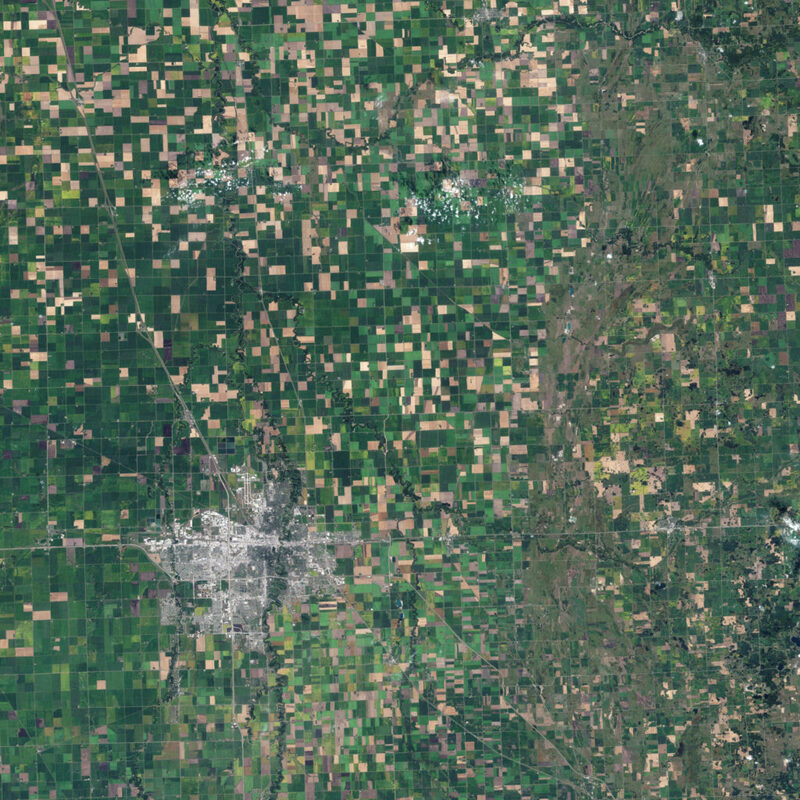 A Landsat image is available approximately every two weeks from USGS. It is processed to remove surface water reflection and clouds by a consultant making the data available within 24 hours of the satellite passing overhead. 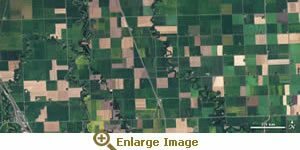 Landsat imagery was chosen over aerial imagery due to the cost (14 meter/pixel at pennies per acre versus 1 meter/pixel at $4.00 per acre). Experience with Landsat has shown that vegetation differences are readily visualized and that the resolution matches the scale of field equipment which is incapable of taking advantage of the higher resolution images. One of the problems with the infrequency of Landsat system is the likelihood that cloud cover will obscure a field which increases the amount of effort necessary to process the images and reduce its accuracy. Plant growth regulators and other inputs are applied to the cotton crop according to prescriptions derived from the Landsat images. Historical data from the Landsat images gathered over 10 years are used to track and manage salt degraded areas of the farm where the output value of the crop does not match the costs of inputs. Landsat has identified approximately 300-400 underperforming acres, with salinity being the predominate concern. Monitoring soil salinity in between crops by sampling at the 6 inch, 1 foot and 3 foot depth. Adding compost and gypsum to the soil and sulfuric acid to the irrigation water as needed. Installed tile lines at a depth of 8-10 feet to remove drainage water to the extent allowed by California regulations. All drainage canals (and irrigation water supplies) are lined or piped to prevent seepage and mixing with fresh water. Drip irrigation minimizes the amount of water and salt applied to the crop but is not used to leach the soil. Rather, when indicated by soil monitoring, sprinklers are used during the wet, foggy winter to leach soils since evaporation is low. The sprinkler system is portable and can be hooked into the drip irrigation system. Sprinkler irrigation that does not pond on the soil surface but moves through the soil as unsaturated flow is the most efficient way to leach salts. Unsaturated flow moves slowly and thus has time to equilibrate with the salty water in the fine pores flushing out the salts with the least amount of applied water. This system does not work if evaporation is high, such as in dry, windy West Texas conditions.